Do you remember in 2012 when I estimated Brookfield Infrastructure Product’s (BIP) value and thought it was a good buy? In my last post I discussed how it worked out very well for investors who bought it back then. So, is it still a good investment in 2017? Yes, I believe so and this updated valuation shows why BIP is an investment you should consider. How can they be so confident with the uncertainty of foreign currency headwinds, weakness in commodities and some economies, and the political climate around the world? As contrarians, BIP’s value investment process and long-term perspective actually thrives on uncertainty. This process has provided numerous opportunities over the years to attractively deploy capital when others retreated. Here are the results, but can they continue? The past two years of activity illustrate how both organic growth and acquisitions together created a “very robust” pipeline. In 2015 BIP invested $600 million in organic growth projects — utility base, toll roads, rail networks, and energy systems — in order to expand their business. Communication tower assets in France were purchased with an additional $415 million to expand the communication infrastructure platform. Over $1.5 billion was invested in Australian rail and port logistics operator Asciano. BIP increased ownership in the Natural Gas Pipe Line Company (NGPL). Along with partner, pipeline operator Kinder Morgan (KMI), they both increased NGPL’s natural gas transmission pipeline system. The year 2016 was especially active in Brazil. Capital fled the country due to economic and political stress, which freed up assets for purchase that otherwise wouldn’t have been available. This included the opportunity to add to the toll road system, buy a major natural gas transmission system, and invest in electrical transmission lines. These assets will generate significant value over time, assuming continued economic and political recovery in Brazil. BIP also invested in toll roads in India and Peru, an Australian container terminal, electric transmission projects in Canada, and is working on communication tower assets in India. Even as $850 million was spent on organic growth, the project backlog was increased with $1.4 billion in new projects, bringing the total backlog to $2 billion. BIP Management continues their outlook commentary “several of the transactions completed this year  may turn out to be some of our best to date. In particular, we are very pleased to have executed upon our Brazilian investment thesis and secure several high quality assets that should generate significant value for us …” Given their past performance, that’s quite a statement. What does all this mean in terms of potential returns for you? BIP is holding to their long-term target of 12% to 15% total annual return. They raised the annual distribution 11%, from $1.55 to $1.74 per share, and at $35 BIP now has a yield of 5%. This distribution raise exceeded their long-term target increase range of 5% to 9% annually. The payout ratio is at 67%, within the target range of 60% to 70% of funds from operations (FFO). Brookfield Infrastructure is a total return investment, consisting of an attractive and growing income stream and potential for significant capital appreciation through organic growth and acquisitions. Most investors view BIP as an income investment, so we’ll use the dividend discount model to reflect the income investment point of view. Think of the discount rate as the opportunity cost, i.e., the return you forgo had you invested this money elsewhere. If there was another investment available where you could earn, say 5%, the opportunity cost (discount rate) would be 5%. 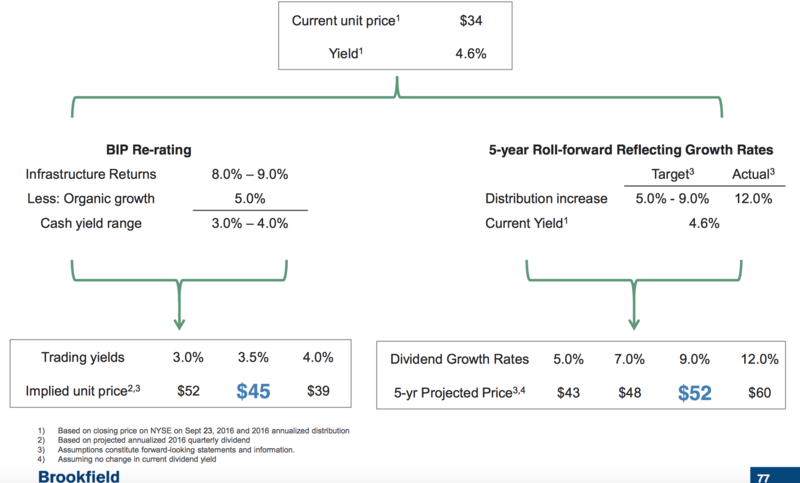 The dividend discount model is a more conservative valuation method which values the stock on the stream of dividends paid to the shareholder rather than the often-used higher cash flow stream. That’s because dividends are unambiguous. They are real payments made directly to shareholders and not subject to accounting variations and interpretations. Let’s be conservative and assume a 10% discount rate. It’s conservative because 10% alternative investments are not widely available in today’s lower return markets. This estimate assumes three distribution growth rates over 10 years; the 5% to 9% target range and the 7% midpoint. The terminal growth rate is declines to 4%, consistent with the World Bank long term global GDP, and the discount rate is 10%. The underlying intrinsic value of BIP, assuming the 7% mid-point distribution growth rate, is $36 per share. At the current price of $35 per share, BIP provides slightly better than a 10% discounted cash flow return. 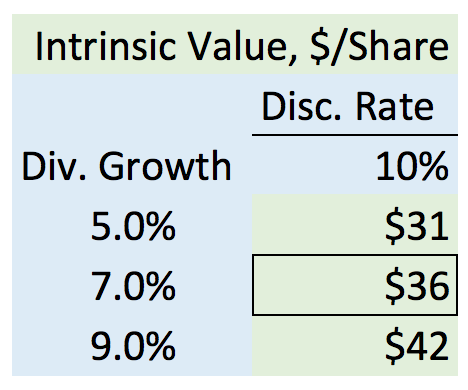 The table below shows the intrinsic value at the three distribution growth rates. The company has exceeded the target with a compounded annual growth rate of 12%. Accordingly, these estimates may be considered conservative. Note: Intrinsic Value updated on 2/27/17 to reflect a lower 4% terminal growth rate consistent with World Bank’s Global GDP forecast. For comparison the potential attractiveness of BIP is illustrated below as non-discounted returns. At the current price of $35 per share, the distribution of $1.74 per share yields 5%. This is well above the 4% average utility industry yield and the 3.5% diversified utility industry yield. If BIP trades at similar yields in the future the share price will have to increase. 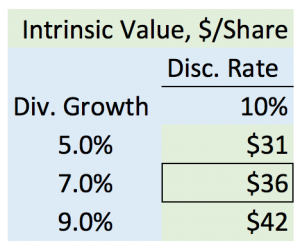 The price per share is estimated by applying these peer group distribution yields. We will accumulate distribution payments over the assumed five-year horizon. The following estimates are for 2021. At 7%, the annual dividend will be $2.28 per share in five years. Applying a utility industry average yield of 4% results in a price of $56 per share ($2.23 / .04 = $57). We are paid to wait. The distribution payments over the five-year period total $10.01, resulting in a total of $67 per share ($57 + $10.01 = $67). This yields an attractive total return of 92%, about 18% per year, over a five-year period. At the annual Brookfield Investor Day, each Brookfield company presents their performance, prospects, and estimates the potential return for investors to consider. The presentations are available on BIP’s website. The slide below is from the Brookfield Infrastructure presentation summarizing management’s view of the potential returns for investors. As you see, BIP projects a lower 2016 price than what I calculated. I estimated BIP’s valuation for 2021 with five years of additional dividend growth. 1. Risks include foreign exchange risks, exposure to government risks, and regulatory and capital markets risks. 2. BIP has many years of successful experience navigating in advanced and emerging economies. 3. BIP’s operating expertise enables the company to identify opportunities with insights not always apparent to financial-only investors. 4. BIP has demonstrated strong capital allocation, capital recycling, growth investments, and value acquisitions. Capital is allocated to the most economically advantageous regions around the globe in a timely manner. 5. BIP’s contrarian investment approach, financial strength, and astute management enables them to acquire infrastructure assets under favorable terms at opportune times. Brookfield Infrastructure Partners appears to have ample room to grow and produce outstanding returns for investors for years to come. BIP’s increasing global presence, growing demand for infrastructure, and management’s outstanding long-term performance will likely continue to reward investors. I’m long Bsuggestion is to go long BIP. Do your own independent research, i.e., due diligence, on any ideas discussed at Value by George. Value by George does not recommend buying or selling any particular security. These are only opinions. Consult a professional for personal advice in order to meet your specialized needs. This communication does not provide complete information regarding its subject matter. No investor should take any investment action based on this information.